The J2M4 Kai Raiden is a premium Rank IV Japanese interceptor with a battle rating of 5.0 (AB/RB) and 4.3 (SB). It was introduced in Update 1.47 "Big Guns" and costs 3,850 Golden Eagles. 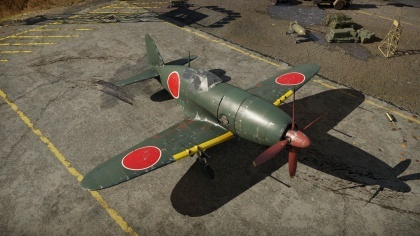 Although a stubby and small aircraft, the Mitsubishi J2M4 Raiden can be considered one of the best Japanese fighters in War Thunder. 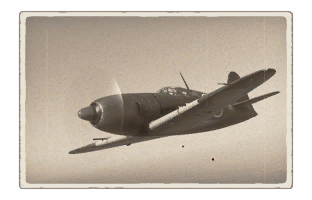 Unlike its other Naval brethren in the Japanese tech tree, the Raiden possesses a top speed rivaling that of the P-51D-5. Wielding four 20 mm cannons, this aircraft spells death for any enemy it encounters. However, the main advantage the Raiden has over its Allied counterparts is its climb rate. In realistic battles, the J2M4 can climb to altitude very fast, especially when given an air start. Once at a high altitude, this allows the Raiden pilot to pick and choose targets, dictating where and when he or she wants to fight. The J2M4's 20 mm cannons may seem lackluster at first, but they have a knack for snapshots, or quick bursts of fire that result in a kill when maneuvering. Generally, the J2M4 performs similarly to the early Fw 190 A variants, having a deadly armament, good roll rate, low top speed, but higher climb rate. Use what the Raiden does best to achieve success - energy fighting. Instead of turn fighting or bleeding all built up energy or speed in turns, attack enemies from a higher altitude and then regain that altitude once the attack has been delivered. The J2M4 excels at Boom & Zoom due to its high rate of climb and deadly armament, even more so than its earlier variants, the J2M2 and J2M3. The Raiden's main downside is its lack of maneuverability. Similar to its German counterpart, the Fw 190 A-8, the Raiden struggles to beat enemies in turn fights, especially Spitfires. If caught in a sticky situation, the Raiden pilot may choose to dive away or seek help from teammates. Trying to fight an enemy Spitfire in a turn battle with the J2M is a terrible idea, unless the enemy aircraft is damaged or many teammates are nearby. Moreover, the J2M's high speed maneuverability is poor, making the entire aircraft lock up. It can be very difficult to pull out of a dive, roll, or turn when at high speeds with the J2M. The Raiden's maneuverability is more or less on par with its enemies in simulator battles, for the most part. The Raiden pilot may also find him or herself outran by high altitude aircraft such as the P-51 D-5 Mustang. All these aircraft have to do to avoid the J2M is dive away and build up speed. Fortunately, the J2M4 has a surprise - a massive ammunition pool totaling 800 rounds. That's 800 rounds of high explosive cannon ammunition that can be dispensed at will towards fleeing enemies. With good aim and practice, it is possible to "snipe" enemies from a kilometer away. Overall, the Raiden is best used as a surprise attack, high altitude, high damage output fighter. While it does not excel in the speed or maneuverability categories, it makes up for that in armament and rate of climb. Featuring four 20 mm Type 99 mk 1 cannons with plenty of ammunition, the J2M4 is capable of destroying all kinds of aircraft. Although destroying heavy bombers like the B-29 Superfortress takes a lot of ammunition, the J2M4 can afford to lose some. The "Stealth" belt has the best combination of AP/API and HEF to shred enemy aircraft, and are recommended for those who do not need a tracer shell to aim. Alternatively, for those not used to IJN 20 mms, the "Universal" belt is your best bet. The "Tracer" belt is filled with HEFt shells, but they only contain half of the power of a standard HEF, and can give away your position. The J2M Raiden was the result of the Japanese Navy request for an interceptor, the need of which became ever apparent after the experiences with the American raid on the Japanese homeland shorty after the attack on Pearl Harbor (Doolittle's Raids). The Chief Designer was Jiro Horikoshi, who also designed the famous A6M fighter. However, unlike the A6M, the J2M was geared for a completely different role, focusing more on rate of climb and speed, then range and maneuverability. The Raiden had only a limited range and was solely used as an interceptor. The most important feat of arms came with the American B-29 raids over Japan, where the J2M Raiden proved to be a real threat to the bombers - the J2M was well armed, fast and the large pools of mmmo meant that despite a small number of Raidens, the four squadrons operating them were credited with the destruction of 21 Superfortresses during the later months of August 1944 to the end of the war. Furthermore, the J2M2 saw limited action in the Philippines, although it was largely ineffective.